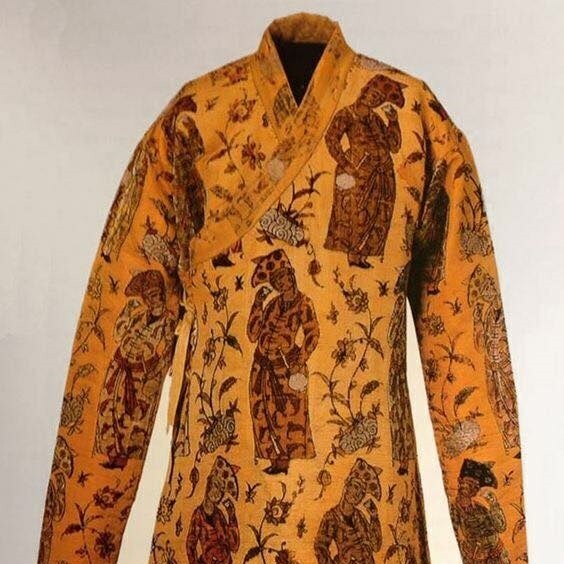 The clothing worn by all the great empires of the East was always elaborate and highly fashionable, long before the Europeans caught up with them. The woven textiles of Persia generally followed designs of Persian carpets and vice versa and to own one of the jackets, vests and copes made by the masterful hands of weavers was certainly high on the list of the powerful, not only to showcase their elite status but also to pay homage to the excellent makers of it. Most of the surviving examples were woven during the Safavid Dynasty of Iran who were tremendous patrons of the arts. Many incredible pieces were woven under their rule. In this article we have a look at four distinct garments that were woven during this artistic era. In the V&A Museum is this most interesting cope woven in the 17th century in Isfahan, Iran. This is a spectacular example of the art made for a Christian community living under Muslim rule in the Middle East. Known as a shurjar, it may have been made for an Armenian church in Isfahan, which had a large Armenian population. This shurjar was woven as a carpet with a very fine silk pile. It is now fragmentary as a previous owner began to cut it up, probably to provide carpet samples. It is made from knotted silk with floral and figurative designs executed in ochre, pink, green, deep blue, pale blue, and white, on a rich red ground. The entire surface is covered with Iranian scrollwork motifs, of blooming flowers and leaves. Within this pattern are figurative scenes of the Crucifixion and the Annunciation to Mary. The cope bears two Annunciation scenes, one at either side of the opening at the front of the cope. 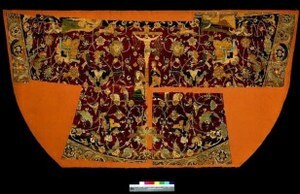 On the back, and, at the centre, the cope bears a depiction of the Crucifixion. This jinbaori vest was made to wear over armor. It was reportedly owned by Regent Toyotomi Hideyoshi and has been preserved through time by Kodai-ji Temple, established in memory of Hideyoshi by his widow, Kita-no-Mandokoro. 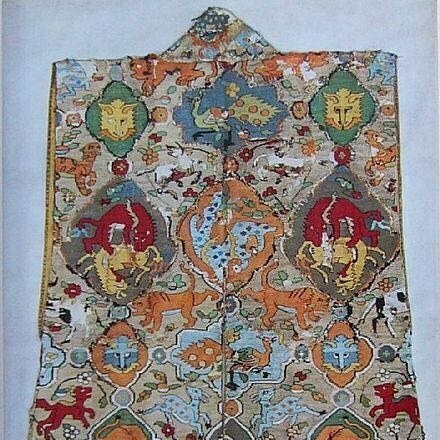 This vest was woven of silk using tapestry techniques. The textile may originally have been a carpet made in Kashan in Persia. The design of a lion attacking his prey is a traditional motif in Persian carpets. Such carpets were imported into Japan by Portuguese ships in the Momoyama Period. Placing textiles on the floor, however, was incongruous with the Japanese life style, so the Japanese rarely used them as carpets. Toyotomi Hideyoshi, the high-spirited Momoyama-Period military ruler, tried to maintain an atmosphere of luxury even within his military camps by turning exotic textiles such as Persian carpets into jinbaori vests. 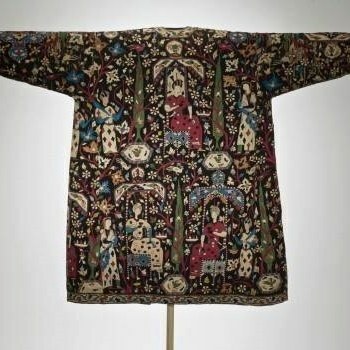 This garment may have been included in the rich gifts sent by Shah Ṣafī to the Russian court in the 1630s. It is a short, fitted coat (nīm-tana) fastened at the side and ornamented with human designs in velvet on a ground of gilded silver brocade; it was presented by Tsar Michael I to Queen Christina of Sweden in 1644 and is now in the Royal Armory in Stockholm, Sweden. What is interesting is that this was a jacket worn by males, so why would the tsar give this to the Swedish queen? Queen Christina became ruler of Sweden after the death of her father, king Gustav II Adolph. Christina is remembered as one of the most educated women of the 17th century. She was fond of books, manuscripts, paintings, and sculptures. With her interest in religion, philosophy, mathematics and alchemy, she attracted many scientists to Stockholm, wanting the city to become the "Athens of the North”. She caused a scandal when she decided not to marry and in 1654 when she abdicated her throne and converted to Roman Catholicism. She changed her name from Kristina Augusta Wasa, adopting the name Christina Alexandra. Before Gustav Adolf left for Germany to defend Protestantism in the Thirty Years' War, he secured his daughter's right to inherit the throne, in case he never returned, and gave orders to Axel Gustafsson Banér, his marshal, that Christina should receive an education of the type normally only afforded to boys. Already at the age of nine Christina was impressed by the Catholic religion and the merits of celibacy. She read a biography on the virgin queen Elizabeth I of England with interest. Christina understood that it was expected of her to provide an heir to the Swedish throne (her first cousin Charles was infatuated with her, and they became secretly engaged before he left in 1642 to serve in the Swedish army in Germany for three years). Christina revealed in her autobiography that she felt "an insurmountable distaste for marriage" and "for all the things that females talked about and did." As she was chiefly occupied with her studies, she slept three to four hours a night, forgot to comb her hair, donned her clothes in a hurry and wore men's shoes for the sake of convenience. Her unruly hair became her trademark. Relations between Russia were very tense for many decades but there were no wars or hostilities during the time of Christina’s reign. It makes perfect sense, therefore, that Tsar Michael would gift this precious jacket to Queen Christina, first as diplomatic offering and secondly as a nod to Christina’s preference for masculine clothing. In the MAK Museum in Vienna is this exquisite ceremonial jacket dating from the Safavid Era in Iran is another great example of the extraordinary workmanship employed at the time to produce textiles that became the desire of the entire world. Not much else is known about this garment apart from the approximate era, size and materials used.